This feature can be quite advantageous for you if you use it properly. 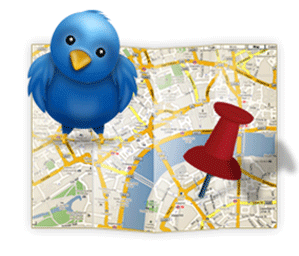 The advanced search on Twitter will allow you to refine your keywords to be location-specific. In the field that says “Near this place”, you can insert your city name, along with the keywords you believe your prospects are searching for. You’ll likely have to try out different keyword variations before you find the perfect ones. Once you have found keywords that dozens are people are tweeting about, you can save it. Of course, you want to focus your time networking with local influencers, rather than with just any ol’ person. You want to get to know other businesses that are being seen and heard by people in your city. One way to find out who these influencers are is to use Tweet Grader’s Top Twitter Cities list. Click on your city and you’ll generate a list of the most active accounts in your town. Don’t worry so much about finding those who are in your target market — it’s all about getting known on Twitter locally. You can’t beat your competitors if you don’t know who they are. If you truly want to top your competitors, you have to know their prices, strategies and customers. One way to get these details is to keep track of competition by using Twitter. You’ll see what they’re up to,so you can counter their actions in a timely manner.